Jump into the heat waves and let the heart rhythms cool down the flow at the 19th Annual Soul Beach Music Festival Hosted by Aruba, sizzling with Sunday night’s esteemed headliner John Legend, a critically acclaimed 10-time Grammy® Award-winning, platinum-selling singer songwriter; and the pure fire of a rising star, Ella Mai, a Billboard chart-topping stunner bringing unmatched entertainment Memorial Day weekend, May 22-27, 2019. John Legend’s work has garnered him an Emmy Award, Grammy Awards, an Academy Award (Oscar), a Golden Globe Award, and a Tony Award, making him the youngest ever to achieve EGOT status, among other multiple awards. Throughout his career, Legend has worked to make a difference in the lives of others noted with the Show Me Campaign (ShowMeCampaign.org), an initiative he launched (one of many humanitarian efforts graced with his passion) that focuses on education as a key to break the cycle of poverty. Ella Mai, Executive produced by Mustard for 10 Summers/Interscope Records, had a great first week landing at #5 on Billboard‘s Top 200 chart with over 69K in equivalent album units in 2017. It is a testament to the years of training and hard work she put in since she was a little girl belting out show tunes. Fast-forward to 2018, her breakthrough single “Boo’d Up” went quadruple-platinum and recently made history as the longest running #1 by a woman on the Billboard R&B/Hip-Hop Airplay chart. The follow up “Trip” broke into the Top 20 of the Billboard Hot 100 and is certified gold. Both songs are included on the new album. With its sheer level of remarkable talent, the 19th Annual Soul Beach Music Festival Hosted by Aruba is sure to mesmerize festival goers. “We’re excited to officially welcome the star-studded talent who will take the stage for the 19th edition of Aruba’sAnnual Soul Beach Music Festival. We are proud to host worldwide sensation, John Legend, and R&B Starlet Ella Mai who will be headlining the Festival. We can’t wait to see them bring dynamic and cultural performances to thousands of visitors from around the world to our Happy Island,” said Ronella Tjin Asjoe-Croes, CEO of Aruba Tourism Authority (ATA). Aruba is a destination with Latitude! A natural oasis for timeless beginnings and soulful memories. Known for its intimate ambience and big hospitality, Aruba sets the tone for a cosmopolitan mix of play and relaxation. Travelers will appreciate the exquisite dining, pampering spas, exclusive shopping and stunning beauty of Aruba’s coastal setting. Soul Beach is more than a music festival, combined with Aruba’s undeniable charm, it boasts the trifecta of a visually breathtaking atmosphere, a multifaceted event and the energy that comes with camaraderie of people across the globe who glow up together, and bask in the three-in-one experience featuring live music performances, comedy shows and beach parties. Soul Beach Music Festival Hosted by Aruba, previously named #4 by USA Today readers’ choice “10 Best Caribbean Celebrations” and #1 “Caribbean Summer Festival” by Jetsetter Magazine, boasts a truly unique and unforgettable event. It’s no wonder festival goers return year after year to Soul Beach Music Festival’s mega gathering and the treasured experience of Aruba’s paradise. “We are super excited to announce the brilliant John Legend’s 1st performance in Aruba as 2019’s Sunday Nightheadliner. We are also thrilled to feature the sensational chart-topping talent of Ella Mai. Get ready a weekend of priceless memories with this soul-stirring combination,” said Mark Adkins, Executive Producer of Soul Beach Festival Productions. 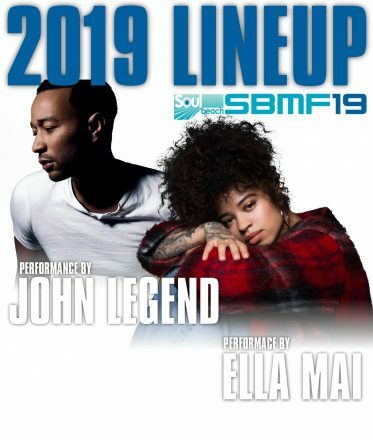 The 2019 Soul Beach Music Festival, #SBMF19, will roll out more highly anticipated announcements of main stage performing artists in the weeks to come. For information about ticket sales, accommodations and the latest updates sign up for CLUB SOUL BEACH, by visiting http://www.soulbeach.com.